Forty years ago, my great aunt, an educator, insisted that my mom and dad plop one-year-old Brian in front of the black-and-white TV to check out a newfangled show that was going to change the way kids learned. I visited “Sesame Street” the first day it aired, and I’ve never really left. Sure, I’ve gotten up on occasion to use the bathroom, make a sandwich, get married, have kids – but I’ve never left behind the joyous world that Henson built. It was, of course, an early lesson on the tremendous power of combining information and entertainment. And it was also a major part of my life. It’s still all drilled into my 41-year-old brain: The cartoon songs (“10 tiny turtles on the telephone”), the live-action vignettes (“There’s a bird on me”), the flesh-and-blood people, just hanging out and often breaking into song (“If you’re happy and you know it”). All good. But “Sesame’s’ finest legacy is its Muppets. Kermit, Ernie and Bert and Grover were as real to me as Bob, Maria, Luis, Susan and Gordon. And they still are. I suspect trench-coated Kermit doing his Sesame Street News Flash live-shots was a major reason I eventually became a TV news reporter. Now that I’m watching it again with my own toddler, I’m feeling Twiddlebug-sized pangs of regret. As nice -- and comfortable -- as “Sesame” is today, I still consider relatively recent additions like Telly, Barkley the Dog, Elmo and Abby Cadabby part of a slightly different neighborhood, one that’s just around the block from the older, rawer and a little grittier Sesame Street of the late ‘60s and early ‘70s. 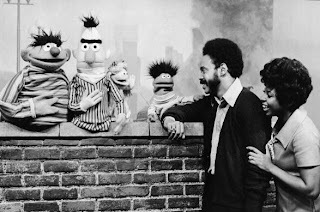 Like “Saturday Night Live’s” Not Ready for Primetime Players, the original “Sesame Street” cast will always be the one that comes to mind when I think of the show. Heck, I even consider Linda, who came on board in 1972 and taught a generation sign language, to have just moved in. The new ‘hood looks and sounds pretty much the same, but the property values are just a hair lower. For me, “Sesame Street” will always be what it was in the beginning, back in the day when Gordon was a completely different person, Mr. Hooper still ran the store, and Elmo was just a ticklish, red-fur-covered glint in his daddy’s eye.